Concrete roof decks have been a staple of businesses for decades. Litigation over water damage from these decks, however, has not been as popular until recent years. Data from the National Roofing Contractors Association indicate that concrete made up 13-14% of the new and retrofit low-slope roof market in 2015-2016. Despite its commonality in the construction market, there is an increasing issue regarding moisture damage to the roofing system specifically created by concrete roof decks. It is no secret: concrete does not exist without water. However, construction companies specifying concrete as a roof deck surface are banking on the fact that all the water is released from the concrete as it cures over a 28-day period. Now, companies are realizing that the concrete continues to release moisture long after its curing period. And, if businesses are not prepared, the excess moisture can deal heavy damage to the roof’s integrity and durability, both immediately and over time, which means there might be plenty of work afoot for insurance adjusters and legal experts alike. Lightweight structural concrete (LWSC) might be at the heart of the sudden interest and wariness of concrete roof decks. Construction companies are opting for LWSC because of its many structural benefits, including lighter weight and less shrinking and cracking. In addition, the shipping and handling alone help to cut expenses, in addition to slashing overall energy costs. Like heavyweight concrete, LWSC contains a high amount of water when it is poured into place. However, LWSC often contains a significantly higher amount of water than its heavier weighted counterpart. The aggregate in LWSC is more absorbent, and more water is used in the pouring process to ensure the aggregate can fill any voids or gaps in the final product. Generally, there is a 28-day waiting period for the concrete to cure. This allows construction companies to test the roof deck for dryness and ensure its suitability. However, it is now known that the curing phase is not indicative of how much water remains in the concrete. Rather, concrete will continue to release moisture long after the curing time. If construction companies are roofing over a concrete deck before it is given adequate time to dry, the moisture becomes trapped and can cause extensive damage to the building, even if the dominating roof is in perfect condition. 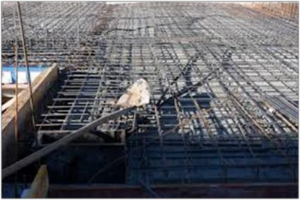 Given the higher moisture content in LWSC compared to heavyweight concrete, the drying time is significantly higher. The Portland Cement Association has indicated that LWSC takes up to six months to completely dry if it has not been rewetted AND if both the upward and downward sides of the slab have drying potential. For many areas, however, rewetting is unavoidable, and many places may not allow for downward drying. It is important to note that moisture retention is not damaging to the concrete itself. It is when the moisture ekes into other susceptible roofing materials that disaster occurs. In the past, hot asphalt was applied to roof systems to create a vapor retarder between the concrete deck and the roof system. This membrane prevented moisture from permeating into the roof system. In today’s systems, this asphalt barrier has been replaced by other methods, including stone ballast or foam. This means that the roof is more susceptible to water collecting within the roofing system, which can comprise the strength and function of insulation, adhesives, fasteners and cover board. This could result in total or partial property loss resulting from wind or hail damage, mold growth or structural deterioration. When this happens, business owners may be looking to their insurance company to cover the damage, who may then investigate to see if it is a case for subrogation. Roof failure can have devastating consequences, both for the business owner and for the insured’s provider. It should not be the business owner’s burden to ensure the construction company they hired understands proper roofing procedures, nor should they have to suffer the fallout from faulty roof work. Water damage can stem from a myriad of triggers, anything from leaky pipes and hot water heaters to faulty roofs and concrete roof decks. It is important to find the root cause of the water damage not only to fix the problem, but also to find out who may be culpable. Subrogation may be a possibility depending on the standards used by the construction company. In the past, 28 days was adequate enough to begin roofing procedures after pouring a concrete deck. Times have changed since then, however, and the NRCA (National Roofing Contractors Association) now recommends waiting six months if using LWSC before beginning additional roofing activity. Surface dryness is determined easily enough, but it is the potential for internal moisture that should give contractors pause. It used to be that simple field tests were adequate enough to test for dryness in concrete, but the NRCA no longer supports some of these common moisture tests from years ago. The plastic sheet test required roofers to tape a clear plastic sheet or glass pane to the concrete and leave it in place for 24 hours. When time was up, they would inspect the sheet or glass for condensation. If present, the concrete roof was declared too moist for a roof membrane. This method has been deemed unreliable, as it can create false results. It is challenging to get an airtight fit around the edges. Plus, temperature differences on each side of the concrete can create a false “dryness” due to the lack of vapor pressure. This common test has been used by the flooring industry for the same purposes: to test for moisture below the concrete surface. By drilling small holes in the concrete and inserting in situ probes, roofers could collect temperature readings over 72 hours to indicate moisture. There are a few challenges with this method, however, and it has not been given a full green light for being a reliable test. For starters, the concrete industry has not declared any standards for concrete moisture, which means no one can say with certainty what internal temperature would be considered “safe” for installing a roofing membrane. In addition, concrete roofs are exposed to temperature variations, unlike their floor counterparts. If it rains, the probe readings could skew the results. One final way roofers are used to testing for moisture is by applying hot bitumen to the concrete and watching for water on the surface to steam, bubble, or splatter. If the bitumen did not react, the roof was deemed dry enough to continue the project. The problem with this method is that the bitumen only indicated surface moisture. There was no way to tell if there was moisture half an inch below the surface. Along with the plastic sheet test and the in situ probes, this method is no longer acceptable by NRCA standards. Keep in mind that there currently is no in-depth test to detect the true moisture level of a concrete roof deck. Roofers are limited to visual assessments and cannot guarantee lack of moisture within the concrete, even after the six-month drying phase. However, if they did not wait the recommended amount of time prior to roofing over the concrete deck, or engaged in any of the unreliable drying tests, their haste could have contributed to any roof failure or water damage, and should be further investigated. Given the severity of moisture damage to roofs and the recent warnings against roofing over concrete decks, one way to avoid it is to stop using lightweight structural concrete altogether. Opting instead for normal weight concrete means using less water during pouring and also cutting drying time in half. However, if your client’s construction company used LWSC in the roofing project, look for any moisture prevention measures they may have put into place. The Midwest Roofing Contractors Association (MRCA) announced it is necessary to include a vapor retarder of less than a 0.01 perm rating (Class I) over new concrete roof decks. This Class I rating essentially acts as a vapor barrier, which prevents moisture from permeating the roofing system. This may complicate things for designers who have included a double vapor barrier in the plans. This dual protection means that any moisture that does get into the system cannot escape. In this case, the designer should consider including one-way vents that prevent moisture from entering, but allow it to leave. Vents, edge details and a venting base sheet work together to create an escape route that helps moisture disappear over time. Having these elements in place may demonstrate the construction company’s due diligence to combat potential moisture problems. There has been some discussion regarding the color of the roof and its ability to harbor moisture. For instance, a black roof offers low reflecting capabilities and may push moisture out of the roof system faster than a white roof with high reflection. This has not been proven, and more research is necessary to determine its accuracy. Depending on the time constraints of the construction schedule, it is clear that shorter time limits prevent adequate drying time. It is worth reviewing the construction timeline to determine if workers were pushed to finish the job without regard to the six-month drying recommendation. Who Is Responsible for Concrete Roof Deck Moisture? If a client’s property damage is a direct result of moisture caused by a concrete roof deck, you might be quick to point all fingers to the roofing contractors. However, keep in mind that contractors are rarely the only ones involved in such a project. True, it is their responsibility to follow safe procedures, check specifications and follow installation procedures, but who is responsible for creating these demands? The NRCA believes that the contractors are not responsible, and may not have the ability to assess the situation properly with today’s standards and technology. Things like concrete mix design, curing, placement and drying time may not be readily available to the roofing contractors, which means they are unable to make an informed decision or may lack the knowledge on how to make these decisions. There are several additional variables worth investigating, including the concrete manufacturer, project manager, project designer, other materials used in the project, the structural engineer and the general contractor. The NRCA recommends that designers do not specify LWSC in their plan because its risks commonly outweigh any benefits. However, if LWSC is used, the NRCA recommends that drying and handling procedures be clearly outlined in the design plan. Not doing so could make them liable for any damages incurred by the insured. The NRCA has already noted an increase in problems linking LWSC with moisture issues. These moisture problems associated with concrete roof decks, whether created with LWSC or otherwise, will continue to plague the construction industry and insurance companies (and quite possibly legal experts) for myriad reasons. Accelerated construction deadlines, lack of reliable testing procedures and failure to install moisture preventatives such as vapor retarders or venting elements all contribute to this current roofing crisis. Given the benefits of LWSC, it is highly possible that issues will continue to appear, at least until something better comes along. Until then, this expensive problem will become the burden of insurance companies and construction legal experts to ensure the correct parties are held responsible. However, knowledge about the true causes of moisture issues is part of being able to combat them properly. Insurance adjusters and litigators alike should take note that this is an increasing problem, and must learn how to ensure it is handled appropriately. Doing so can help bring problems with LWSC concrete roofing (and concrete roof decks in general) into the light, and may initiate much-needed reform in the industry.